That wasn't easy at all...The only proper datasheet was from adafruit, which refers to a completely different pcb layout..
(Fig2) The schematic of the lcd backpack module. This module is intented to be soldered on the back of the lcd. 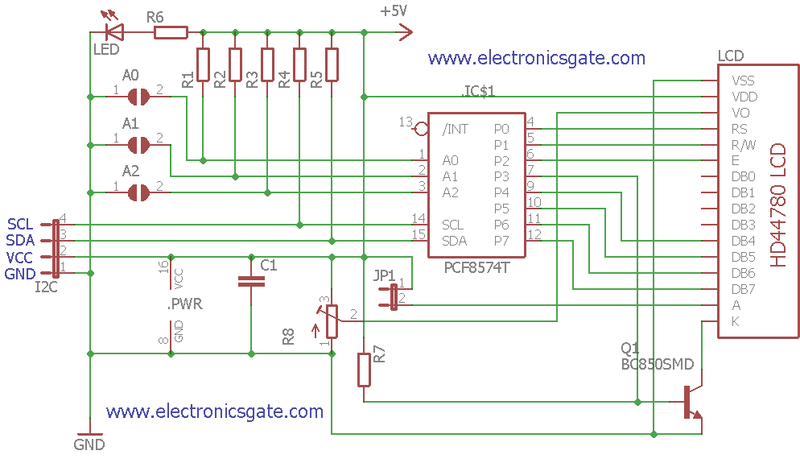 The only adjustments that you can do is the contrast of the lcd display, and the addressing of the PCF8574. 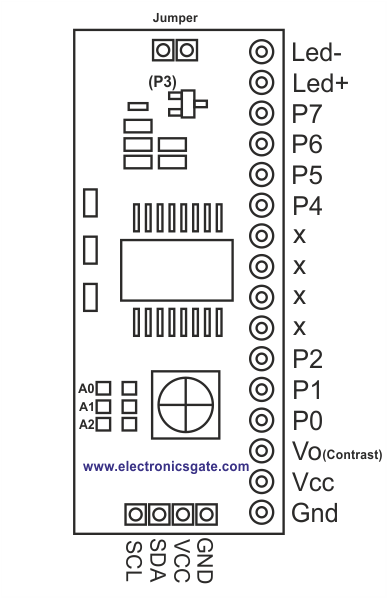 by soldering or desoldering the pads from A0 to A3. Instead of that they could have used jumpers so you could easily change the module address. it won't matter to make a brief analysis that came out from	my reverse engeenering. Vo goes to contrast pin of the lcd. P0 goes to RS pin of the lcd. P1 goes to R/W pin of the lcd. P2 goes to Enable pin of the lcd. P4 goes to DB4 pin of the lcd. P5 goes to DB5 pin of the lcd. P6 goes to DB6 pin of the lcd. P7 goes to DB7 pin of the lcd. Led- goes to lcd's backlight.